Foxrock-Cabinteely captain Amy Ring and Mourneabbey’s Doireann O’Sullivan have collected The Croke Park/LGFA Player of the Month awards for October and November respectively. Talented attackers Ring and O’Sullivan will lock horns at Parnell Park on Saturday December 8, when their clubs go head to head for the All-Ireland Ladies Senior Club Football title. Both players were superbly consistent as their clubs captured county and provincial honours – and they’re sure to play key roles on All-Ireland Final day. 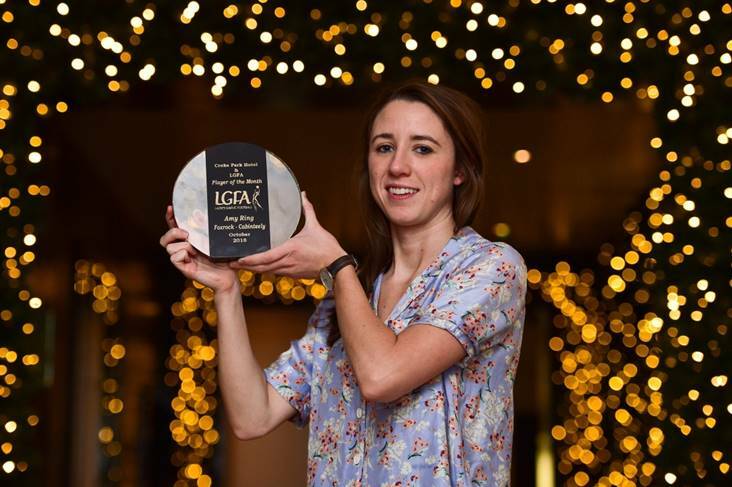 Ring’s October award is richly deserved as she starred in the Leinster championship victories for Dublin outfit Foxrock-Cabinteely over Shelmalier (Wexford) and Simonstown Gaels (Meath) during that month. Ring, 28, scored 0-2 in the Shelmalier game and followed up with 1-3 against Simonstown Gaels as Fox-Cab, managed by her father, Pat, progressed to the Leinster Final. Ring has continued in that rich vein of form since, scoring a combined 3-8 in two outings – namely the Leinster Final victory over Laois outfit Sarsfields (2-4), and the recent All-Ireland semi-final defeat of Monaghan’s Donaghmoyne (1-4). A new name will be etched on the Dolores Tyrrell Memorial Cup on December 8 when Fox-Cab and Mourneabbey meet. The clubs clashed at the semi-final stage last year, a game won by Cork stars Mourneabbey, before Carnacon beat them in the All-Ireland Final. Central to Mourneabbey’s march to a fourth All-Ireland decider in five years has been county star Doireann O’Sullivan. The hard-working and free-scoring forward contributed 0-8 in the All-Ireland semi-final win against Galway’s Kilkerrin-Clonberne, in what was a superb individual display. Previously, in the Munster Final against Waterford side Ballymacarbry in late October, 23-year-old O’Sullivan scored 0-9. O’Sullivan is also in the running for a TG4 All Star award, with the winners to be revealed at the Citywest Hotel next Saturday evening, December 1.